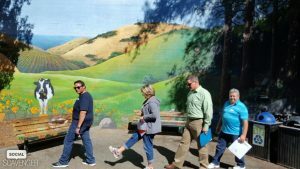 Event Description: Boasting a thriving downtown area, with fine shopping, great restaurants, famous chefs and more than a few delicious breweries, Santa Rosa is a fantastic, safe place to do a corporate teambuilding event. Location History: Gateway to the California wine country, Santa Rosa was once home to the Pomo, Miwok, and Wappo Indians. According to popular legend, this area was named Santa Rosa by the Spanish padre Father Juan Amorosa. After baptizing a young Native American woman in a stream, he followed the usual custom of naming rivers and creeks for saints. Because the baptism took place on the day of the Feast of Santa Rosa de Lima, Santa Rosa was the name given to the stream (and later to the whole valley) as well as to the young woman who was baptized. During your teambuilding treasure hunt… expect to meet the mysterious bottle cap sculpture; a giant hand; a collection of Sonoma County celebrities, high on a wall; a 1937 Dodge; and so much more.